Since 2012, News Feed ads have been the center of Facebook’s business. But the number of ads the company can show there is approaching its upper limit. As Facebook looks to new formats such as mid-roll video ads and messaging ads, concerns remain over video ad engagement, measurement and more. This report, based on extensive interviews with marketers and ad agency executives, digs into five factors that could impact future growth—and what marketers need to know about them. As the second largest digital publisher in the world, Facebook is expected to bring in $36.29 billion in worldwide ad revenues this year, up 35.0% from 2016. Within the digital display category, Facebook is No. 1 by a wide margin. 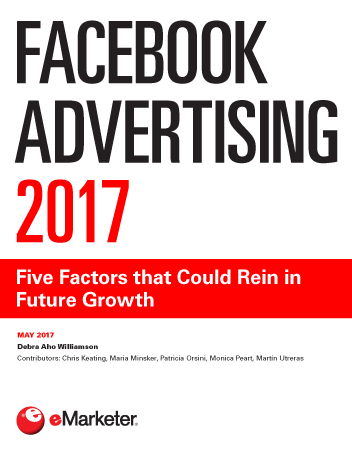 Facebook ad spending is still rising at a fast clip, but the pace of growth will be markedly lower by 2018 than it was in 2016. eMarketer forecasts 26.5% growth in 2018—less than half the pace of the 57.4% increase seen in 2016. Factor No. 1: The News Feed—Facebook’s bedrock—is showing its age, and ad load in the feed will reach its upper limit this year. As the company approaches this turning point, there is increased pressure to launch successful next-generation ad formats. Factor No. 2: There are questions about users’ engagement and mood when using the main Facebook platform (partially due to the rise of fake news)—even though total user counts and time spent on Facebook continue to rise. Factor No. 3: Facebook’s video ad strategy hasn’t completely jelled, and some advertisers have been underwhelmed with their results. Factor No. 4: Measurement glitches and a walled garden approach to sharing data are making advertisers more uncertain about whether their ads are performing as well as Facebook says they are. Factor No. 5: Recent brand safety concerns centering on Google and YouTube could extend to Facebook, with video advertising and the Facebook Audience Network most vulnerable. "Ads in the News Feed have helped Facebook achieve enormous success in digital display advertising, with revenues far ahead of other publishers."